The 2017 Fall Arizona Riparian Council campout will be Saturday-Sunday, October 7-8 at the Bonita Creek Campground ~ 20 miles northeast of Safford. 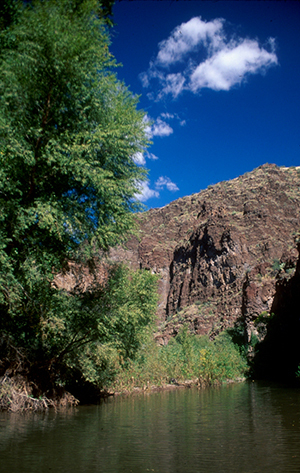 Bonita Creek is a tributary of the lower Gila River Box. The focus of the campout will center on the role of beaver in desert stream ecosystems and their role in stream restoration. 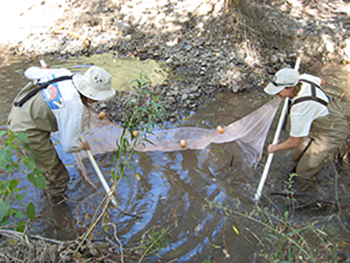 BLM biologist Jony Cockman and her crew will describe changes noted in Bonita Creek, Eagle Creek, and the Gila River since they became part of the Gila Box Riparian National Conservation Area in 1990. Cliff dwellings, historic homesteads, Rocky Mountain bighorn sheep and over 100 species of birds make this year-round watery desert refuge worth the short drive from Safford. We’ll also learn about beaver’s beneficial impacts to vegetation, streamflow, pools, fish and bird populations. 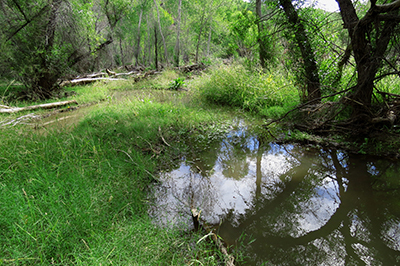 Bonita Creek is an Arizona Department of Water Resources-designated “Outstanding Water” of Arizona, and supplies domestic water for Safford. Below beaver pond on Bonita Creek. Subject to change, our tentative schedule is to have self-guided exploration on Saturday from 11:00 a.m.-1:30 p.m. There will be presentations and discussion from 2:00-5:00 p.m. Happy hour and dinner (the usual burger brigade) will follow. Coincidently, the Draconid meteor shower occurs this night. On Sunday at 9:00 a.m., we’ll participate in volunteer seining, or hikes and excursions to experience the more remote areas. Tip: the vegetation is dense and wet crossings are guaranteed, so be prepared and dress appropriately. Wrap-up by ~1:30 p.m.
Due to the very limited number (7) of campsites at Bonita we will double up, and we’ve set a maximum number of registrants at 20. You’ll need 4-wheel drive or high clearance vehicles to get to the camp. We encourage early arrival to secure a camp spot, because there are no advanced “reserved” spots — we’ll be competing with the public and is first-come, first-served. Try to come early Saturday morning, or even Friday evening. The Bonita campsite is basic, with a couple of picnic tables, and a restroom. Bring your own water, beverages, table, chairs, tent, hors d’oeuvres, breakfast, and 2 lunches. The Arizona Riparian Council’s registration is $15 per person to help cover costs of food and supplies for everyone. From Safford, take East Sanchez Rd 8 miles to Bonita Creek Rd. This road will parallel the Gila River corridor. Take Bonita Creek Rd 3.7 miles to the fork leading to River View CG. This is an upland route. From the forks, stay on Bonita Creek Rd and proceed 0.6 miles down into Bonita Creek. Notice the fish barrier (looks like a small dam) as you descend into the creek. At the creek you will be on Solomon Pass Rd. Proceed 0.8 miles up drainage to the City of Safford Camp Ground. Contact Tim Flood at tjflood@ATT.NET.